A highly successful test of a prototype power generator at the University of Dayton Research Institute bodes well for NASA's plans to expand its exploration of Mars with the next rover mission. In early February, NASA scientists narrowed down potential landing sites for Mars 2020 to three — Northeast Syrtis, Jezero Crater and Columbia Hills — at least one of which is likely to be warmer than sites where previous rovers landed. Simultaneously, researchers in Dayton performed a high-temperature qualifying test on a power generator prototype to see if it would operate successfully at the higher temperatures that may be experienced by the generator powering the next rover. The Mars 2020 rover will be powered by a Multi-Mission Radioisotope Thermoelectric Generator (MMRTG) — similar to the unit currently providing power to Curiosity in Gale Crater — which converts heat created by naturally decaying plutonium radioisotopes into electricity to power the rover's instruments, computers, wheels, robotic arm and radio. The heat generated by the MMRTG also keeps the rover's mechanical, computer and communication systems at operating temperature, even as the Martian nights dip to as low as -150 degrees F.
The University of Dayton Research Insititute houses two MMRTG qualification units identical to Curiosity's generator, except they are powered and heated with electricity rather than plutonium. 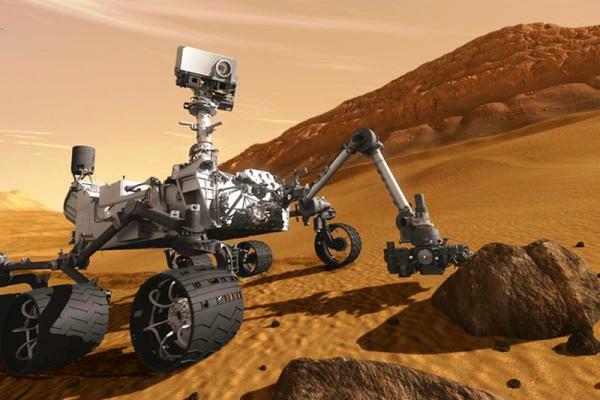 For the last three years, researchers have been designing and running experiments to provide NASA with critical information related to Curiosity's continued exploration, as well as in support of Mars 2020 and other future missions. And so with cots and sleeping bags handy, UDRI scientist Chad Barklay and UES (Beavercreek) engineer Allen Tolson spent 36 hours camped next to the one of the generators — sleeping only 2.5 hours each during the test — while they heated the unit to 428 F, approximately 100 degrees hotter than the max temperature Curiosity's generator experiences. They held the unit at that temperature for 24 hours, prepared to quickly shut down the experiment if they observed any behavior that threatened the system. Barklay said the test was necessary because at least one of the potential landing sites for the Mars 2020 rover is warmer than Gale Crater, where Curiosity is exploring. "The maximum temperature at Gale Crater is about 32 F during the day, but it could be up to 35 degrees warmer at Columbia Hills," he said. "Although that doesn't sound like much, an increased Martian surface temperature means the surface of the MMRTG could potentially get much hotter." The experiment, supported by additional University of Dayton researchers and attended by representatives of Teledyne Energy Systems, Aerojet Rocketdyne and Oak Ridge National Laboratory — who also had an interest in its outcome — was highly successful, Barklay said. "It went better than anybody could have hoped," he said. "Everyone was very impressed with our ability to design and develop a test setup and protocols that were unlike anything ever done before. We were very pleased." NASA is expected to decide a final landing site for the mission in the next two years. Mars 2020 is targeted for launch in July 2020.